Currently sat outside a café in Buenos Aires with free wireless internet access. Got a great cappuccino which came automatically with a little glass of fizzy mineral water and a little croissant with a blob of milk based caramel in the middle. How can you keep your weight down with free cake, especially when the coffees are so small! Being a vegetarian in Buenos Aires in Argentina has been very easy. There are lots of Italian style dishes like pizza and pasta but with LOADS more cheese heaped on top. Lost of yummy salads and you always get bread with your food. 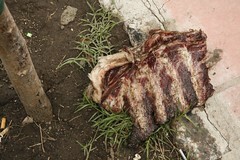 Meat is a big thing in Argentina though and they eat every part. In many restaurants you see big grillers or in some you see a big wooden fire with big hunks of meat hanging at the side. The smell is pretty good even for a vego. Needless to say Bianca dived in head first to a big, juicy, dripping bit of cow. 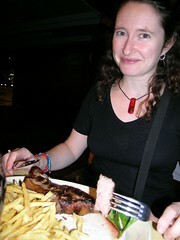 I think it’s her first steak for a year (well done!) so I had to get a photo of her caught in the act. By the way you may be interested in this report about the main culprits behind global warming according to the UN. Forget buying a hybrid car - just eat less meat ;) Thanks Chris for pointing me to this.